Maybe caring for your dog's ears is not a priority for you. Some lucky dogs never have dirty ears, and some will never have an ear infection in their life. However, for many small breed dogs, ear problems can become chronic. 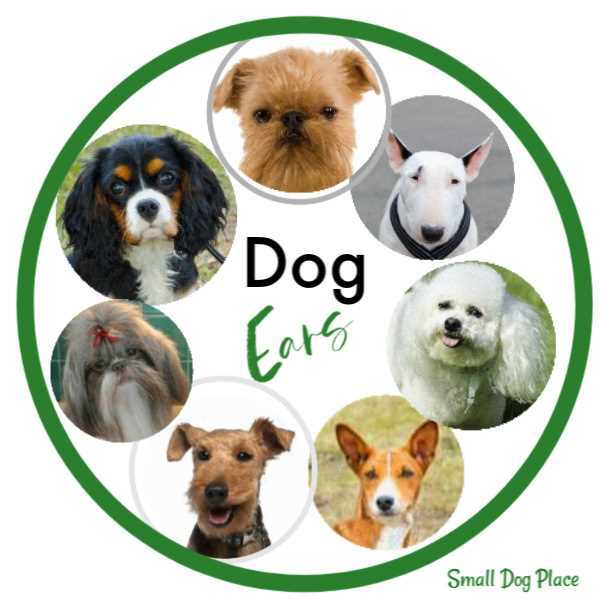 This group of dogs is prone to infected ears, and their owners spend a considerable amount of time and money on keeping those little ears healthy. Sounds like an ideal way to spend a day if you are a dog, but sometimes these lucky dogs end up with problem ears. Water in the ear canal, whether it is from the bath or the ocean can create a moist environment for bacteria and yeast to grow. Those that love swimming pools can be affected by the chlorine and other chemicals needed to keep the pool clean. Small dogs who enjoy a swim in a lake, river or ocean are also exposed to additional germs. We all know that these bodies of water are not sterile. Dogs that roll in the grass can pick up foreign objects that stick to the inside of ears creating an irritation that leads to infection. For dogs that enjoy long walks in the woods, there is always the possibility of picking up a tick or two or another foreign object. Many small breed dogs have hair in their ear canal, and that hair continues to grow unless it is removed. If hair is not plucked out periodically, ear wax can clump on the hair along with anything else creating a warm, moist, dark environment that bacteria and yeast love. Dogs with little erect ears are not necessarily immune from ear infections, but they are much less likely to be plagued with dirty ears and painful infections. Dogs that have thick, heavy ears that hang low are most susceptible to ear infections. Spaniels as a group are most likely to have at least one if not more infections over the course of their lifetime. For many dogs, ear infections are just one symptom of a bigger problem such as allergies or a hormonal imbalance. Without treating the underlying problem, these dogs can end up having chronic ear infections regardless of the type of ear anatomy they might have. Caring for your dogs ears is a three step process that does not need to be time consuming, but can reap benefits to your small breed dog. Dog owners become keen observes not only to the dog's behavior but also their health. Observing ears need not be time consuming and you can check out their ears while watch television. Look for redness, swelling, discharge, or the presence of little specs of what appear to be coarse black pepper. Smell the ear canal. Does it have an odor? Is there a discharge (dark brown, yellowish, or bloody)? Any of these signs should alert you to a possible infection. Does your dog scratch around his ears? Shake his head? Stop and call to make a veterinary appointment. If any of these symptoms are present, it will be a judgement call on you to determine if you want to continue with step two: cleaning. Some infections are so painful that even the slightly touch can be excruciating to your dog. When it gets this bad, the veterinarian may need to anesthetize the dog, to clean out the ear. Always err on the side of caution. Not all dogs need their ears cleaned. Never fix what is not broken. If the ears look fine, leave them alone. There is no need to clean them and anything you introduce into the ear canal can disrupt the delicate ph balance. For dogs that have a slight waxy buildup, a moist or dry cotton ball maybe all that is needed. If this is your dog, dip a cotton ball into a little warm water and wipe out the ear canal, where ever you can see. There's no need to use cotton tip applicators as they can push wax farther down into the ear canal. Dry the ear with a dry cotton ball, and you are done. Place a few drops of the ear cleaner into the ear canal. Massage the base of the ear for about 15 to 20 seconds. Allow dog to shake. The shaking loosens and dislodges debris from the ear canal making it easier to clean. Use a cotton ball to clean what you can see. For small dogs, I recommend tearing apart a cotton ball and using only about 1/4 to 1/3 ball at one time. Each time you clean, you will want to use clean cotton. You may use a cotton tipped applicator but do not poke into the canal where you can not see. A small amount of the cotton ball wrapped around the cotton tipped applicator will make this procedure safer. Continue until the visible ear canal is clean and dry. Apply medication if prescribed by your veterinarian. If your small breed dog has ear hair, you will want to remove it periodically to prevent ear infections. Ear wax, ear hairs, moisture from swimming or bathing, and any other debris creates a fertile ground for an infection to brew. Most ear infections are caused by yeast or bacteria and anything that gets trapped in the canal is likely to remain. The anatomy of a dog’s ear canal creates an environment where any debris or water gets trapped making it very difficult to get out on its own. Some dogs do not mind at all and others will squirm and wiggle. This procedure is uncomfortable but not painful. I like to compare it to plucking eyebrows, if you have ever done this. REMINDER: If you take your dog to a professional groomer every six to eight weeks, the groomer will perform this procedure for you. Sprinkle a little ear powder into the ear canal and spread around with your fingers or a cotton ball. Using your fingers, tweezers, or hemostat, gently and slowly remove a few hairs at a time. Continue until all hair has been removed. Add a couple drops of ear cleaner into the ear canal. Massage, Allow dog to shake. Remove ear cleaner and remainder of the ear powder. Here's a little video I made that will help explain the procedure if you want to try this at home. Dogs are more receptive to removing ear hair if you pluck a few out slowly and gently rather than remove a large clump at a time. If your dog protests, give him a break, massage his ears, and then resume when he is relaxed. Remember that professional dog groomers generally do this as part of their grooming routine if you get your dog groomed regularily. Observe your dog regularly for signs of infection. Examine your dog after a romp in the woods or a roll in the grass. Remove irritants immediately. Clean ears periodically, but not so often that you cause irritation. Keep the dog’s ears dry during and after baths. You can use a small wad of cotton in your dog’s ear during a bath and dry thoroughly after the bath. Dry ears well after the dog has gone swimming. Pluck ear hairs from the dog’s canal periodically. The products that I list on this page and every page on this site have been tested by me and my (uh hum, 15 dogs). This is not to say that they will work for you, but rather, they have been successful for me. If you are unable to get to your Veterinarian, this solution may help. Zymox Otic Solution is used to treat bacterial, viral, and yeast infections occurring in the outer ear. It also contains hydrocortisone which helps to reduce inflammation and soothe the ear so there is less scratching. Truseb contains Ketoconazol 0.1% solution and is designed to flush away pathogens, parasites and other dirt and keep the ear clean and dry at the same time. It's intended to solve problems such as itching, discharge and smelly ears due to mites, yeast, and bacteria. This is a good, all round cleaner if your veterinarian does not recommend one. Epi Otic has a low pH, contains no alcohol or chlorhexidine and is meant to be used as a routine ear cleaner. For dogs prone to ear problems, a once weekly cleaning with a product like this will help keep bigger problems from occurring. Ear wipes are another option especially if you are pressed for time and don't want to mess with cotton balls and liquid cleaner. You will want to purchase a good ear powder if you plan to remove hair from your dog's ear canal. The powder gives you the friction needed to grab, hold, and pull the hair. Without a powder, the hair is waxy and difficult to remove. There are several types of forceps or hemostats for pulling out the ear hair: Straight, curved, locking or non-locking. I believe that it is really a matter of personal preference as to whether you choose locking or non-locking. I personally find the locking to be easier because you can grab a few hairs, lock the hemostat and then pull. Some people find locking to be a bit intimidating. There is that extra step to lock so if you feel this may be too much, choose the non-locking type. Hemostats come with straight or curved tips. You can also purchase a kit with one of both which might be the wisest choice for someone just getting started.This way you can experiment with both to find out which one works the best for your dog. Caring for Dog's Ears is neither difficult or time consuming, and should be a part of a regular grooming program. Professional dog groomers will routinely clean dog ears but often this bi-monthly service is not enough for some dogs. It requires the owner to take charge and assure that their dog's ears are cleaned regularly. When larger problems surface with symptoms mentioned earlier in this article, a visit to the veterinarian is highly advisable.